Sounds like the internet connection to the box, or in the box, has gone down. 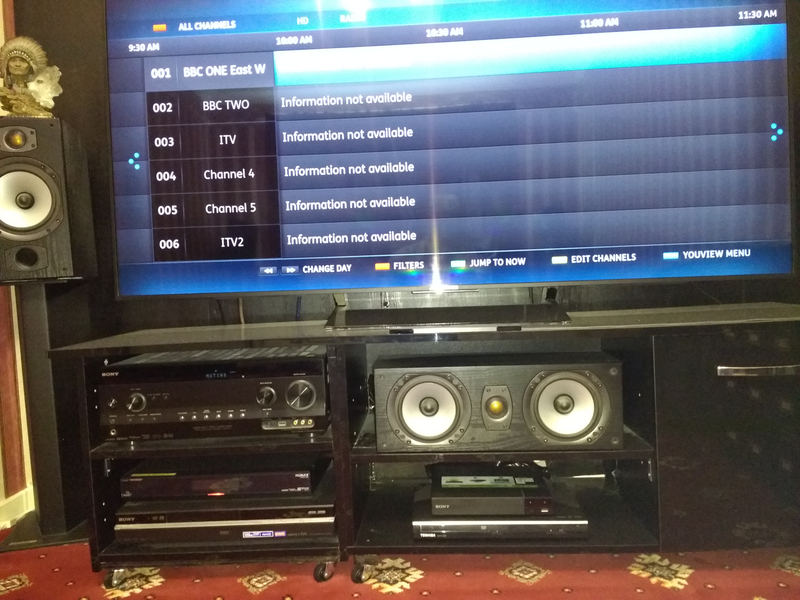 Try starting the BBC iPlayer on the YouView box - will this work? As a test, try taking a laptop, turning off its WiFi, pulling the Ethernet connection off the YouView box and putting it in the laptop. Can you reach the internet through the laptop, with things set up this way, or not? This will tell you, and us, if the problem is with the YouView box, or with its connection path to the router. Can I presume the TV Reset was a full hard Factory Reset from within Settings, and not just the five-second remote flip? If not, do that Factory Reset. This is always the second thing the Sony mods tell you to do, and don’t offer much more help if you don’t/haven’t ; I agree with them here, though, as this solves so very many transitory problems with these beknighted Android TVs. If you have no All4 and itv Hub, though, I wonder if you are actually running the Freeview UI on the set, and not the YouView one? Which would also explain why you can’t get programmes that were on today, and maybe why you haven’t mentioned not getting programmes from the past week, which the YouView UI displays, but the Freeview interface doesn’t. I presume you have a terrestrial aerial, and have tuned the terrestrial channels in? If not you need to arrange this and do this. Can you see the previous week on the EPG? 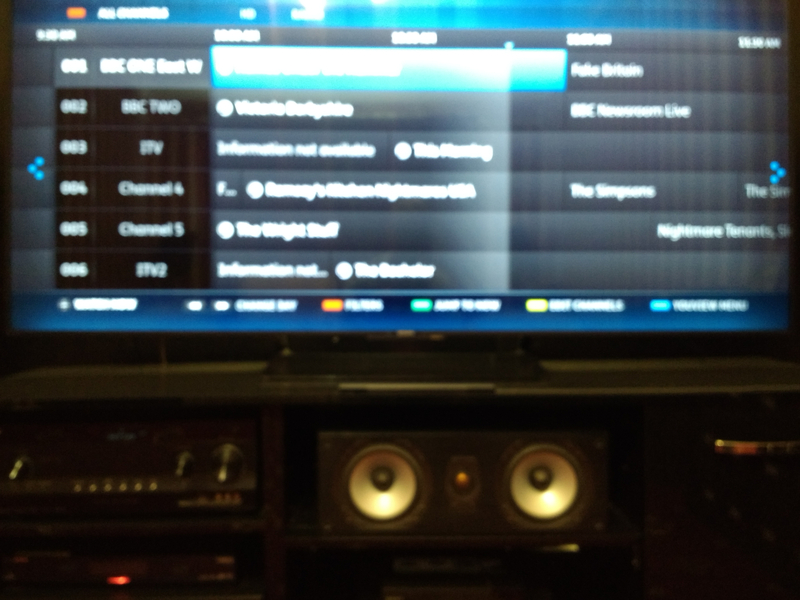 If not, you need to start the YouView app on the TV, and go through the procedure there. If still no go, can you please post a screenshot or screenshots of your EPG here? I did a TV reset via the TVs Troubleshooting Help page. This did involve holding down the power button for 5 seconds. I also tried a TV reset from the TV settings This was just a quick enter to commence it. However; the pricedure after that seemed to follow the same sequence as the previous reset, so it was unlikely to be a full factiry reset. How is that achieved? When I said I had reset the "You view"; I did it by disabling it on the TV settings menu, then re-enabling it. Yes; I have returned the channels. When I press the back arrow on the remote, the display shows that the new date is selected with the words "Information not available" written where the program name should be. As for sending you a screenshot; I have taken 2 snaps here on my phone. 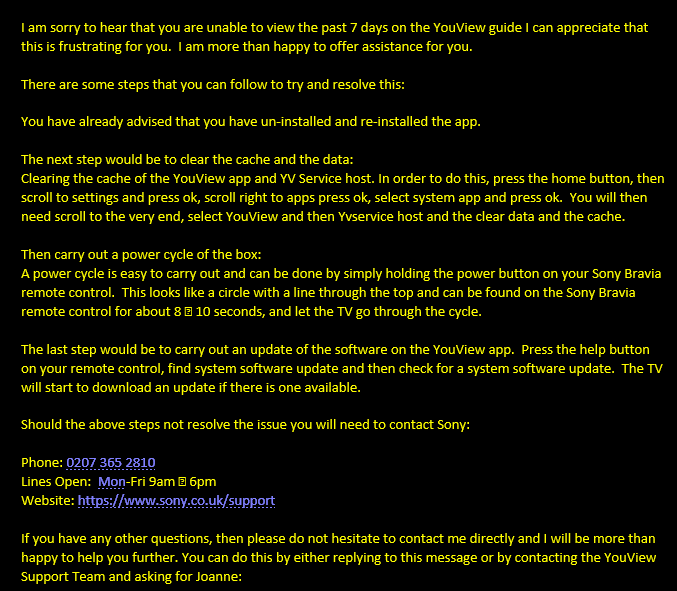 Update:- As well as seeking help on this forum; I also emailed "Sony" & the official "Youview" Help site. So, I received a reply from "Youview". I followed the steps suggested and the problem has been corrected. I will endeavor to sent you a copy of this for your interest. Could not send the file of the email. pC says wrong file format. Will try again. Could you post an "executive summary" for everybody's benefit? No, it will not accept the file format whether I drag and drop or open the file. I will be happy to forward the solution as per the email from "Youview" if someone will give me an email address to forward it to. Copy and paste not work? No, The "copy" appears to go well, but when trying to paste, the word "paste" on the menu is blanked out. Erm, you copy from the source and then paste on here? I bring up the email concerned. On its options I choose "Save as"
This takes it to "This PC - Downloads". The title is ok so I click "save"
Menu appears called "PC Documents" which includes the file I want. I highlight it. I click "open". On the thread page at the bottom on the left side a message appears for a few seconds, it reads "File Format is not allowed." What device are you using? Does it not have the facility to select the text you want and then copy it? Following your last comments I have used the "Snipping Tool" to capture the email, then went to "Pictures" to find and "Open" it. Looks like that worked. Cool, thanks. So which bit fixed it? I could not say as there were several operations, so I did every one then tested and found it worked. As you now have your issue cured, you won’t need the full Factory Reset for this. As it would have cleared the cache that YouView Support told you about, it would have worked, but might well have been overkill.